PHILIPSBURG - Enhancing the experience for arriving and departing travellers and bringing the Terminal Building back online “post-haste,” was the message given to airport management by Tourism Minister Stuart Johnson when he toured the Princess Juliana International Airport PJIA in his capacity as shareholder representative on Wednesday. According to a press release issued Sunday, Minister Johnson also reemphasized the importance of the PJIA to the island’s overall economic revitalization. He said the Airport’s reconstruction, including the provisions to build the US Preclearance facility, is part of the governing program 2018 -2022 and represents a vital feature of the government’s plans for redevelopment and creating a sustainable St. Maarten. One of the main reasons for Johnson’s visit was to get a realistic impression of the potential for reopening the terminal building for the start of the new tourism season in November this year. To date, several media articles have highlighted the cry from the local population and business community about the alarmingly long time it has taken to see real signs of reconstruction at SXM. There is also international pressure from tourism partners to get the airport back on track urgently. 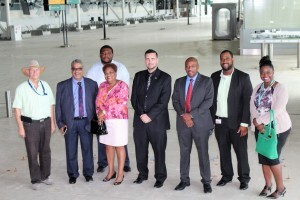 Besides, local hoteliers who are investing millions of dollars in the reconstruction of their properties, have also expressed their concerns over the delay in rebuilding the airport, and have asked for solutions to the immediate financial issues facing the Princess Juliana International Airport NV. According to the release, these matters have the minister’s immediate attention. Johnson is also calling for more effort in the interim to improve the experience for visitors and residents at SXM..
Johnson met recently with Dutch Representative in St. Maarten Chris Johnson and Hans Leijtens and discussed amongst others, the securing of funding for the airport reconstruction. As a result, the Dutch Government has agreed to issue a statement of commitment, which is forthcoming, to assist the PJIAE in securing the necessary funding for its reconstruction. Meanwhile, Minister Johnson expressed grave concern about humidity inside the tents presently being used as temporary Arrival and Departure halls. He said notwithstanding the devastation to the airport caused by hurricanes Irma and Maria in 2017, the comfort level of passengers and SXM staff and others working in the arrival and departure halls must remain a high priority. Management at PJIA has assured Minister Johnson that they would give urgent attention to improving the ventilation at the Arrival and Departure hall. The PJIA was asked to urgently address the comfort level of visitors and workers and encouraged them to find practical ways to help circulate the cold air coming from the portable Air-Condition units. Johnson told PJIAE ‘s Management Board that he is eagerly awaiting the recobstruction of f the Terminal building . He made mention of the recent media publications which showed passengers standing outside the departure hall in long lines and said the speed of work to repair the terminal building and replace the check-in kiosks must be increased to improve the ease and comfort of travel. The Minister and his delegation were accompanied by the airport’s Chief Operation Officer Michel Hyman, Project Manager for the airport reconstruction Rob Noorman, Chief Financial Officer and Acting Chief Executive Officer Ravi Daryanani and Corporate Communications Officer Audrey St. Luce-Jack.